With more than 20 years of experience in the field of lasers and education eLas produces and offers educational laser systems ideally suited for practical laser and physics training. 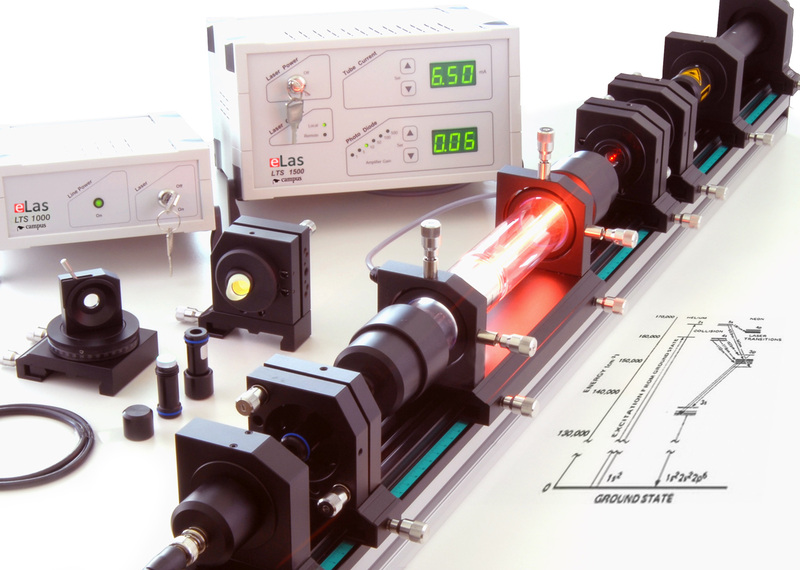 Within campus more than 15 training systems of the topics optics and laser fundamentals, laser metrology, fiber optics and telecommunications are presented by eLas. As the successor of PI miCos GmbH in the field of laser education systems, we continue with these products. Therefore these systems are 100% compatible with the former PI miCos products. Four lasers from the class of gas lasers, diode lasers and solid state lasers are presented here. The lasers are mounted on optical rails, and each component can be individually positioned and is easily accessible (see section "optomechanical components"). Open and well-tunable resonators of the helium-neon and Nd: YAG lasers allow the demonstration of laser modes as well as the introduction of elements for wavelength tuning, frequency doubling or Q-switching. A fiber laser can be operated both linearly and in ring configuration, mono- and bidirectionally. Furthermore, the function principle of an EDFA can be demonstrated. For a safe and proper handling of lasers a basic knowledge of optics is absolutely necessary. This covers an understanding of principals of optical radiation and its measurement, of interactions such as absorption and emission, and of optical resonators. The experimental kits of this group, built on the optomechanical components of eLas, are dealing with acquiring this know-how and enabling the handling of the relevant optical elements. Another aspect is the recognition and correct classification of the hazard potential of lasers. For this purpose, the system "laser safety and classification" offers a variety of experimental training possibilities. The field of laser metrology includes experimental setups like Michelson and technical interferometer, laser gyroscope, laser rangefinder & velocity of light, and laser Doppler anemometer, all based on the proven opto-mechanical components from eLas. Measurement techniques which involve either the detection of spatial shifts in the sub-micrometer range or the measurement of ultra-short time intervals in the nanosecond range are demonstrated. These techniques are widely used in commercial devices, but are explained here in an open structure and with as much insight and many settings in their operation. In this subject, basics of glass fiber and plastic fiber processing, the coupling of light into optical fibers, transit time measurement of light in fibers and damping and loss measurement are learned. Although these experimental setups do not represent complete lasers, but only use laser diodes as the light source, the rail-carrier system has also proven itself here. The training also covers techniques from simple, precise fiber cleaving through the assembly of fiber connectors to the splicing of glass fibers. Technical applications such as OTDR or the transmission of data over long distances by means of glass fibers are introduced in experimental setups. The spectral properties of laser light are in the foreground in this experiment on Fourier transform spectroscopy. Different light sources with different spectra are objects of investigation. A uniform, motorized displacement of one of the two mirrors of a Michelson interferometer setup is used to measure an interferogram of the light source. The measurements of the time domain are transformed into the spectral domain. This results in the power spectrum of the light sources. In the future, this field will be extended by an experiment on Raman spectroscopy. For designing your own setup eLas offers opto-mechanical components. It is developed to reach highest rigidity and flexibility of laser systems in laboratory as well as in laser machines. The system is based on a flat rail-carrier mechanics with “click" mechanism. The optical height is 65 mm. The system contains a wide range of rails, carriers, holders and adjusters. The click-mechanism enables changing of optics during the experiment without additional tools. The compatibility of the system to other mechanics systems allows optical setups in combination with all the three classical construction assemblies, rail-carrier, breadboard and post mounting.